Simon Carr and his American partner are into the second round of the boys’ doubles. Carr in action at last month's French Open. FOLLOWING THE DISAPPOINTMENT of missing out on a place in the boys’ singles draw at Wimbledon, Ireland’s Simon Carr has progressed into second round of the boys’ doubles this afternoon. The 17-year-old and his American partner Alexandre Rotsaert came from a set down to beat their Mexican opponents 5-7, 6-1, 6-4 on Court 5. 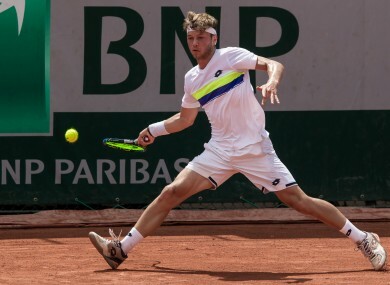 Carr, the son of former Dublin Gaelic football manager Tommy, last month secured his first win at a Grand Slam junior events at the French Open but lost his first round singles qualifier at SW19 earlier in the week. The Mullingar native bounced back in the doubles event, however, and he and Rotsaert will now face Ondrej Styler and Alexey Zakharov in the second round. Email “Ireland's sole Wimbledon representative secures first round doubles win”. Feedback on “Ireland's sole Wimbledon representative secures first round doubles win”.